The problem is that we're all still nerds. If anyone's going to bid on us, we'll need some spicing up. And who better to help with that than sorority girls who like nothing better than a makeover? We'll choose a handful of brave nerds to take one for the team. The girls get to have their way with them and we'll document each makeover. We'll make a snazzy video and show it over dinner. 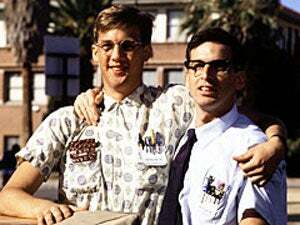 After the dinner, we'll auction off the now studly nerds. Ha, ha, he said "snazzy"! Anyway, despite the fact that this stunt has managed to get national attention for the school's computer science program (and is a total rip-off of Beauty And The Geek) the dudes in the Linux Users Group have yet to find a sorority at their school willing to participate in this project. Maybe, like other tech geeks we know, they need to offer themselves up for bikini waxes?